Featured image: Reprinted with permission from Kroupa et. al., Nano Lett. 2018, ASAP. Copyright 2018 American Chemical Society. Science is the most interesting at the interfaces of fields and materials. Quantum dots (QDs) are fascinating in that they bridge the interface between molecules and bulk solids. QDs are very tiny solids (~10 nm) that absorb and emit light in unique ways due to their tininess. Not only are they interesting to scientists, QDs have been commercialized in TV displays and solar panels. Despite this commercial adoption, the field of QDs is relatively new to science, since the chemistry involved to make them was poorly understood until recently. Today there is extremely good understanding and control of the synthesis of quantum dots. The control is so robust for lead (II) sulfide (PbS) that we can easily change size and the surface coating (called ligands) with simple chemical reactions. 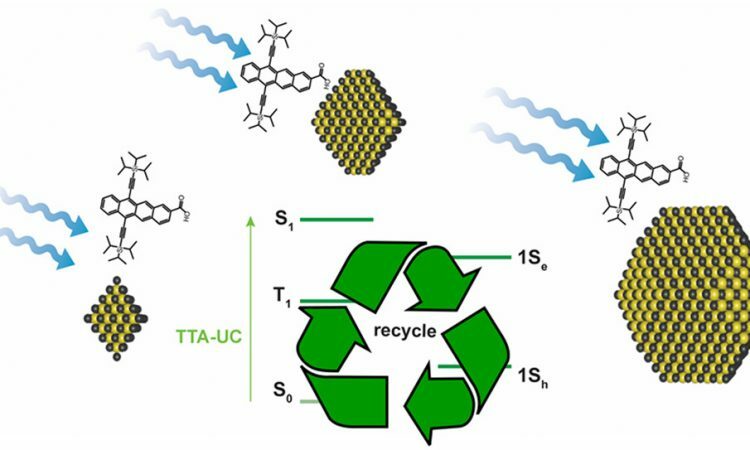 In this work, the researchers utilized previous methods to exchange the weakly interacting aliphatic (sp3) carbon surface coating of PbS QDs for something new and interesting: a stabilized tetracene molecule derivative (Figure 1). The PbS QDs were successfully coated with a surface layer of the tetracene derivative. Why is this cool? The tetracene based molecule and PbS QD both individually have remarkable properties when observed with UV and visible light. When they are put together, the interactions with light get really interesting. Figure 1. (Left) The tetracene based molecule bound to a PbS quantum dot. (Right) The photoluminescence of the quantum dot with tetracene before and after purification. Reprinted with permission from Kroupa et. al., Nano Lett. 2018, ASAP. Copyright 2018 American Chemical Society. There is a lot of data in this paper, but I find two things to be the most exciting. First, there is electron transfer between the QD and organic tetracene that is reversible when excited with light. This means that when you excite this system with light, the electron goes from the quantum dot, to the tetracene, then back to the quantum dot. How does this get probed? Through ultrafast time measurements. Take a spectroscopic image of the particles while exciting with light, then another image 5 nanoseconds later to see the change in the particles interaction with the light. If this is repeated over and over, it can be seen that the quantum dot has the electrons, then the tetracene contains the electrons, then the quantum dot again. This has been hard to show in the past, since the synthesis produced messy systems where tetracene was left free in solution as well as bound to the QD surface. These researchers took a page out of polymer chemistry’s playbook, and purified their products with gel-permeation chromatography (GPC). The result was pure QD-tetracene structures, enabling these spectroscopy studies. The other fascinating thing about this work is something called photon upconversion, which occurs in this system. In a typical luminescent material, you can excite it with a certain energy of light, and you get an equal or lower energy light out during emission. In upconversion, a material combines multiple photons to doubly excite an electron, and a higher energy light comes out than went in (upconversion, like the name implies). An example would be putting low energy, red light into a system, and getting higher energy blue light out. This system here works from the synergy of the tetracene/quantum dot mixture. The proposed upconversion comes from the QD absorbing light, exciting an electron to tetracene, then the tetracene absorbing light, excites the electron even further up, before emitting higher energy light back out – which is cool. While some studies on quantum dots focus on their use in electronics, this work shows a clear picture about how electrons move around quantum dot – organic systems. Better understanding of such systems can enable future work in everything from organic-quantum dot electronics, to undiscovered applications, such as electronic watermark signatures.